The republic of Georgia, though small in territory, has seen major changes in recent years. Public backlash triggered by a drawn-out confrontation with Russia has brought new faces in power. A young cohort of politicians from the Georgian Dream party is facing a difficult legacy left by ex-president Mikhail Saakashvili. 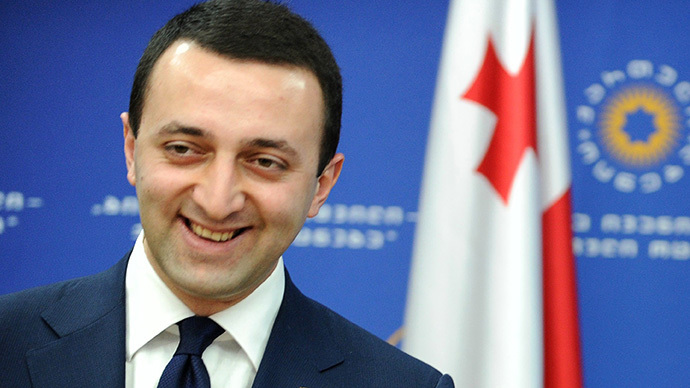 We talk to the nation’s new leader, Prime Minister Irakli Garibashvili – the youngest elected leader in the world. Sophie Shevardnadze:Prime Minister, only two years ago you were making your first steps in politics. Meanwhile, Georgia is transformed from a presidential republic into a constitutional republic and all of a sudden you find yourself holding practically absolute power. Were you expecting something this huge? Irakli Garibashvili: Frankly, I never expected it to happen. However, life is a strange thing and it's full of surprises. To me office or position does not imply luxury. Neither is it a matter of honor or fame. One’s position implies responsibility more than anything else. It is the duty I have assumed before my country and my people. And it is the responsibility I have before Mr. Bidzina Ivanishvili, who has put his trust in me and entrusted me with the fate of our country. I am extremely motivated. I am motivated to do a quality job in every way, no matter what I do. And most importantly, I am motivated to be honest to my people and my country. And we should never be ashamed to look back. This is my guiding principle. This is the principle that has guided me through my whole life. SS: Nobody doubts your sense of responsibility, but do you have enough experience to govern the country? You are 31, the youngest prime minister in the world as of today, your minister of interior affairs is 28, and in general, your cabinet of ministers is very young. And since you brought up Mr. Ivanishvili, who is the richest man in Georgia and also your mentor, critics say that he will be governing the country behind the scenes, not you. IG: I understand. This skepticism has always been there. It was there when I was appointed minister of interior. I was 30 at that time. The ministry was in lamentable shape when I took over. The system was totally politicized. And I’m proud to point out that we put the ministry back on its feet. And trust in the police has doubled in the past year. The level of trust in the police is 86-87 percent, while it used to be way down before. Mr. Ivanishvili always gave me – and I served as minister of interior for a year – enough freedom. I was always free to make my own decisions. As for the skeptics who believe he will be running the show behind the scenes, I will never feel embarrassed to say what I am about to say. I have said it before and I will say again that Mr. Ivanishvili is my role model, and I will always follow his example. I will always accept advice from him, especially since I know that this man gives only useful and beneficial recommendations to his people. And if we have to listen to foreign or local experts, critics from the opposition, why can’t we listen to someone who made a difference of this magnitude in the country? He freed our country and society from a monstrous regime, that is, the National Movement regime. It just does not make any sense to me. And if we claim to be pragmatic and efficient, then why not listen? This is my answer. And I am being totally honest with you. SS:Since you've mentioned the opposition. There are many things that happened for the first time in Georgia in the past 18 months, the first democratic election in the history of Georgia, peaceful transfer of power. And it is for the first time that an actual opposition is present in the parliament. Having a real opposition force in the parliament – an opposition that dislikes you so much and will oppose you in many ways – is it a good thing or a bad thing for the country? IG: If we look at this issue in terms of politics, we can call them an opposition force, of course, but I would say that they are very hard to understand in general. They are more of an opposition to themselves. They are opposing their own people, their own citizens, and their own country. In other words, they are not doing anything new in reality. SS: So you do not view them as healthy competition? IG: It is very difficult to maintain healthy competition with them. There is no such thing as healthy criticism from them. I’m not sure they understand what the word healthy means in the first place. Neither do they know what the word objective stands for. I want to remind everyone – and I know that quite large audiences are listening to us now – that these people have been offering their citizens a deception-driven type of democracy. It was just a façade democracy. It was all façade. I have looked into every field. Name one field where they have not implemented façade changes, façade reforms. These people have prosecuted 300,000 people. To me, it is disastrous – 300,000 of their fellow citizens in nine years. It was a very ambiguous regime, if you are interested in my take on this issue. I cannot accept all this quietly and without emotions. Moreover, I cannot accept calmly criticism from them, their sabotage or moral lecturing. This is cynicism at its worst. This is my take on today’s opposition. Of course, by the opposition I mean the National Movement, that is, the parliamentary minority. SS:In the past 10 years, Georgia has been positioned abroad as a country that has undergone substantial changes. Even President Saakashvili's fiercest critics admit that certain modernization processes have been successfully implemented in Georgia. Now not only members of your opposition, but also foreign investors say that Georgia is backsliding, that its economy is worsening, and that investors are no longer as eager to enter Georgia. Some even fear that the country is on its way back to the 1990s. IG: I totally disagree about economic downslide. Let me remind you that the economic downslide – if we can refer to it as downslide – started as early as 2012, that is, under the previous government. A vast amount of external debt has been accumulated during their period in power. Even this year we had to cover significant amounts as part of the country’s external debt. The same is true of next year. We will have to pay about $800 million. And who assumed this external debt? We are forced to cover the debt assumed by the previous government. This is one example out of the many. And when our party won the election, but President Saakashvili was still in power, he openly stated both at home and abroad that a horrible government had come to power and that this new monstrous government, this destructive force, would bury the country. This is what Mikhail Saakashvili said. And they kept doing it all year. In light of all this, it is very difficult to convince the investor that you can guarantee stability. And it is a well-known fact that investors are the best scouts in the world. They are very sensitive to stability. They can measure stability with unique precision. They know exactly when it is advisable to invest in one or another country. This is what happened in reality, nothing else. Nothing special, at least. Our economy has been through much tougher periods under the previous government and yet no one talked about it. SS:During the cohabitation period, many of Saakashvili’s colleagues, members of his cabinet, were apprehended and interrogated. At this point, President Saakashvili himself is out of the country. When and if he returns, will he be questioned too? IG: I cannot say with all assuredness. As for the arrests, when investigation agencies have actual, substantial evidence proving that someone, even if he or she is a senior official, such as former Minister of Interior and former Prime Minister Vano Merabishvili, whom we arrested, as well as some former ministers and former high-ranking officials… I have said this on many occasions and I would like to reiterate that no office or position guarantees immunity. Let us take my position for one, which is very high. If I commit a crime and five or 10 years from now a new government comes into power, and this new government finds out and proves that I have committed a crime, I should be held liable. We do not enjoy immunity. As for your question whether or not interrogating agencies will have questions to President Saakashvili, if there are any questions raised during the process of investigation, of course, Mikhail Saakashvili, the former president, will be questioned. And I repeat that there is nothing special about it. SS:President Saakashvili had a very concrete foreign policy agenda. He wanted ascension to NATO and the European Union. He constantly quarreled with Russia, which ultimately led to a war. How does your foreign policy differ with that of your predecessor? IG: As for the main priorities of our foreign policy, they remain the same. We made it clear, and I would like to reiterate, that European integration and NATO are the main directions of our foreign policy. These aspirations of ours are supported and nourished by the will of our people who want to see Georgia become a fully-fledged member of the European Union and NATO. You probably know that over 70 percent of our citizens support Georgia’s accession to the European Union and NATO. The European Union is not some kind of political whim. Let me explain why necessarily the European Union. If we look at the history of Georgia, we will see that our ancestors and our country have always longed for and had aspirations in relation to Europe and European civilization. This is not something we have devised. Thus, we continue what our ancestors started. We are truly attracted by European values. As for other political aspects, the European Union implies a number of advantages. It will open its market and make it available for Georgian production. And I believe it should make one proud to see products labeled ‘Made in Georgia’ in the European market. This implies gaining a foothold in a different market. As for political aspects, we are talking about safety, security, mobility to and from the EU zone. All this will have an impact on the welfare of our citizens. SS: You know Europe well…you lived in France and hold a master's from the Sorbonne. The EU is not just a blue flag with stars, but also Europe in crises and numerous Brussels bureaucrats. Politics are mainly dictated by Brussels. Everything starting from agriculture to immigration policies are decided there. Small members aren't really asked their opinion or taken into account. Who decides on political and economic advantages? IG: So you are referring to the future when we are a member state, right? That is an interesting question. However, I would like to underline one point. We are well aware of all those difficulties that we will have to face and overcome. However, Georgia does not have a better choice. Europe is the only right way. There is nothing better than Europe. You may know of something better. If so, please let me know. Europe, European culture, this is our historical choice. I understand the high level of bureaucracy and I understand that the decision-making process is more complicated there. Yet there is more safety. There are more benefits. This is why we aspire to join Europe. SS:You say that Georgia shares European values. So do you think Georgia is psychologically ready? For instance, I am thinking about last year's anti-gay protests bashing - is Georgia ready to be tolerant like Europe? IG: I did not say that we are ready today. What I am saying is that we must develop incrementally, step by step. I say we are not yet. And the European Union knows this better than anyone else. We have many tests to pass. If a student does not do his or her homework, he or she will flunk. This is why there are grades in school. I cannot say in what grade we are now. What I can tell you is that we are moving in the right direction. All I can say is that it takes consistency – I often use this word because that is exactly what we need. SS: If NATO membership is as important then this precludes good relations with Russia. Russia has said on many occasions that it is against NATO’s eastwards expansion towards its borders. And we are not talking about EU membership here - this is something that threatens Russia's national security. How do you intend to solve this conflict of interests? IG: Our position concerning NATO remains the same. We have confirmed it more than once and I will confirm it once again. Georgia aspires to become a NATO member state. As for your question how we can match and harmonize those interests, it is a tough question indeed. Unfortunately, we have failed so far to achieve tangible improvements in relations with Russia. As you know, for years one of the main claims of the Russian government has been the inability to cooperate with the previous government, the government of Mikhail Saakashvili. You remember the previous government’s rhetoric, which was absolutely unacceptable and full of hate speech. We changed this rhetoric. You know we started to reset and improve our relations with Russia. We have spoken about this issue many times. You may know that we publicly expressed our willingness and wish to conduct direct dialogue. Within this format, bilateral meetings are held between the prime minister’s personal representative and Grigory Karasin. You probably know that the process of successful improvement of what I call technical relations is well underway, meaning improvements in trade relations. As you know, the ban on Georgian wines, mineral waters, and other Georgian products has been lifted. All this is, of course, helpful and serves the purpose of building trust between the Georgian and the Russian peoples. Since we came into power, our European and American partners have constantly urged us to regulate our relations with Russia. This has been their main appeal. It serves our interests as well. Russia is our neighbor, and warm relations between the Georgians and the Russians have always been in place. And we the Georgians remember these relations that have been and still are between us. You know that up to a million Georgians live in Russia. We fully realize that. In light of all this, the processes along the occupation line seem incomprehensible to us. SS:It's understandable that relations must be reset, but how exactly will you accomplish this task if you become a NATO member? I repeat that we are not talking about an EU membership, which Russia may or may not like. Russia openly states that if NATO expands near its borders, it will do everything in its power to prevent it. The Russians point out that it will threaten their national security. IG: Yes, but we must succeed in convincing Russia that Georgia cannot possible pose a threat. The fact that we aspire to join the European Union and NATO does not imply a threat against Russia. This is our task. I understand that it will be difficult. But this is why dialogue is necessary. This is why actual negotiations are necessary. And I would like to say a few words about the conflicts. These conflicts must be resolved. Otherwise, it will be very difficult to hold effective talks with Russia. This is a very painful issue for us. SS:Do you think that Russia is ready for a serious political dialogue? IG: I do not know. And this is exactly why our government expresses its will to hold dialogue with Russia. We have already taken that step with a view to resetting and regulating our relations. In my opinion, I truly believe that it is a heavy burden to have recognized Abkhazia and Tskhinval as independent states. And if, as a hope – I am quite optimistic about this issue – the Russian government decides one day to reset relations with Georgia by means of peaceful conflict resolution, it will be the best case scenario. Let me remind you that under the previous government, when it was absolutely unacceptable for Russia to engage in any type of dialogue with the previous government – and it was openly stated that they would not speak with Saakashvili – even then this process did not occur, meaning the barbwire process. It was not as intensive then. And now when a new government has come into power; now when we have actually changed our rhetoric; now when there is actual willingness to reset our relation and create a means of direct dialogue; it is incomprehensible why they continue this borderization process, installing barbwire so intensively. Thus, we do have a number of questions. SS:You just mentioned the barbwire. Why are you so optimistic then? In a recent interview Putin said that none of it would have happened had it not been for President Saakashvili’s decision to enter Tskhinval. But since that happened, he believes this process has been completed and is irreversible. Russia recognized Abkhazia and South Ossetia as independent states. IG: Nonetheless, the same President Putin made a statement about the necessity to build trust between the Russians and the Georgians and that this process must be expedited. This borderization process impedes the process of confidence-building. It is truly incomprehensible to us and our government. On one hand, we honestly want to restore trust among our nations. On the other hand, there is this borderization process which creates a great deal of discomfort: instances of temporary incarceration of people are intensifying; several houses wound up on the other side of the dividing line. Our population is very concerned about all this. We have all made mistakes. Let us admit that we have all made mistakes in the early 1990s, for example. There is no way only one side can be spotless and unblemished. But we take it close to heart. We are hurt because our Abkhazian and Ossetian brothers no longer live with us. Somehow I believe and I feel that sooner or later the Abkhazians and the Ossetians will be compelled to live with us. And I certainly hope that this dream too will come true. SS:I have spoken to many Abkhazians and Ossetians. And most of them say “We will coexist with anyone but the Georgians.” Besides, 15 years have passed, a new generation has grown that does not remember Georgia and does not understand why it should be part of Georgia. What would you tell those who'd rather be with anyone else but Georgians? IG: There are radicals everywhere at any given time. Radicals may exist in Georgia, as well as in Abkhazia or Tskhinval. But I am talking about reasonable people who think rationally about the future of their children and their own future in general. I am not talking about those holding radical views on the Georgians. Even their statement that they do not see themselves coexist with the Georgians seems incomprehensible to me. You have to try really hard to come to dislike coexistence with someone who is earning to coexist with you and who offer you to restore the brotherly relations you once had. Most importantly, Russia must come to believe that we pose no threat; we cannot possibly pose a threat. We have already proved in the past year that we are not successors to the aggressive and radical policy pursued by the previous government in relation to Russia. And once again, nearly all the countries of the world are trying to maintain normal relations with Russia. Why should our relations with Russia be tense and messy? It makes no sense whatsoever. SS: The Sochi Olympic Games are a very hotly debated topic in Georgia. Some believe that Georgia must boycott the games, while others think that it should not. What is the official position of Georgia at this point? Is Georgia participating in the Olympics? IG: We held discussions on this issue, whether or not Georgia should participate in the Olympics. The government made a decision that Georgia will participate in the Sochi Olympics. This decision was made by us in cooperation with the Olympic Committee, of course. Thus, our athletes will participate in the Sochi Olympic Games. SS:Will you be there to root for your athletes? IG: No. No delegation of our government will be present in Sochi. Our athletes and senior officials of the Georgian National Olympic Committee will surely be there, though. SS:Prime minister, thank you very much for the interview. IG: Thank you. I hope I was quite straightforward. And I think we covered everything.